In October 2006, the Satellite Division and Environmental Systems (DSA) was involved in the High Profile Training Event (HPTE), a series of interactive online lectures that were broadcast to World Meteorological Organization (WMO) Members in each Region; and this first step was an important milestone in the development of the CoE Brazil. 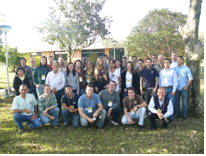 This initiative was replicated for Portuguese-Speaking Countries in November of that year and, since then, the Brazilian National Institute for Space Research (INPE), specifically the Center for Weather Forecast and Climatic Studies (CPTEC), through the Satellite Division and Environmental Systems (DSA), is part of the Regional Centers of Excellence for Training in Satellite Meteorology of the WMO serving as a source of training material and courses in Portuguese language. DevCoCast Workshop “Capacity Building” – June 2011. Thus, the CPTEC/INPE cooperates with the WMO Space Program to reach one of its main objectives: to promote the capacity of its Members to use satellite data in a broad and significant form, with particular attention paid to the needs of developing countries. Under the Virtual Laboratory for Satellite Training, the CPTEC/INPE, through its Virtual Resource Library (http://webaula.cptec.inpe.br/visitview), develops and disseminates educational tools, and also provides an extensive list of presentations and lectures on the use of satellite data and products, as well as samples of real-time data applicable in multiple WMO regions. Moreover, the CPTEC/INPE, as a WMO Centre of Excellence, also organizes and offers online courses and classroom sessions. The online courses consist of series of interactive lectures that were broadcast to the participants using the Brazilian National Network for Education and Research (RNP), together with Moodle (Modular Object-Oriented Dynamic Learning Environment) (http://poapem.cptec.inpe.br/moodle/). The RNP interconnects 15 state networks in Brazil, the Federal Institutions of Higher Education, the Research Units of the Ministry of Science and Technology, as CPTEC/INPE, as well as public and private education and research institutions. Students from Latin America and Portuguese-Speaking countries from Africa have participated in DevCoCast Workshop 2011. Students and professionals from Brazil have participated in our courses, but also these training events have reached different South American and Portuguese-speaking countries. The CoE Brazil is committed to contribute with more and better training material and courses, especially in Portuguese language. To reach this goal, we plan to offer several online and face-to-face courses during the current year. These activities are announced in our web site and in the VLab Calendar.